Francis Daniel Salvador was the fourth generation of this wealthy family of Sephardic Jews to live in England. His great-grandfather, Joseph established himself as leader of the Sephardic community in England and became the first Jewish director of the East India Company. The family wealth was much diminished by losses in the Lisbon Earthquake in 1755 together with the failure of the Dutch East India Company. However, a 7,000 acre tract of land had been acquired in Carolina and in 1773 Francis went out to develop this property. Joining the cause for American independence, he was elected in 1774 as a delegate to South Carolina's revolutionary Provincial Congress and took a leading part in supporting the Declaration of Independence. He joined the militia in 1776. Encouraged by the English Superintendent of Indian Affairs, Cherokees were attacking frontier settlements of South Carolina. During an action near Esseneka on 1 August he was shot and scalped. 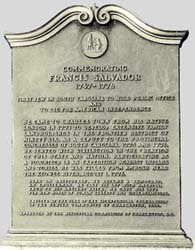 There is a memorial slab commemorating his short life at Charlestown. His family remained in England. In 1767 he had married his first cousin Sarah, daughter of his uncle Joseph Salvador, also known as Joseph Jessurun Rodrigues (1716 1766). By 1773 there were four children. Later, his widow and three of their children (John Lovell, Esther Anne & Leonora Mary) were baptised into the Christian church at St Mary's, Twickenham, on 6 June 1780, Sarah being described as "relict of Francis Salvador, a converted Jewess". The family are stated to have lived in a property known as The Lodge (sometimes Twickenham Lodge). The house stood on a substantial piece of land adjoining the Hampton Road, to the north of Wellesley Road in Twickenham. The Salvadores do not appear to have owned the property and they were not listed as ratepayers, so the duration of their stay is not known. The property, then described as a farm, came into the hands of John Davenport in 1775 when he acquired it from Edward Styles. In 1769 a Moses Salvidore (sic) Esq paid rates for a small parcel of land and, for some months in 1772 for a substantial property, but neither the property nor his relationship can be identified at present. Returning from India in 1780, William Hickey stopped off in Amsterdam in early June and met a son of this family, who apparently had been a childhood Twickenham acquaintance: "I directly recognised him as the youngest Salvador with whose family mine had been intimate for many years". This son was not named and it is not clear whether he was a son of Francis or another branch of the family.